Lame duck Republican Sen. Jeff Flake announced his support for CNN White House correspondent Jim Acosta at the end of his speech during the congressional correspondent dinner on Wednesday night. “And I’ve enjoyed well almost every minute of it. The work you do here is more important than ever and you do it well. Please keep doing it. 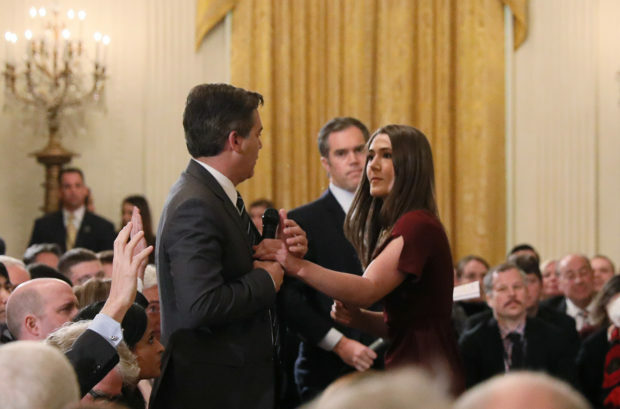 And lastly, and most sincerely, go get ‘em Acosta,” he said. Flake’s show of support for Acosta comes the same day he ruffled party leadership on the Senate floor. He demanded the Senate protect the special counsel and when Senate Majority Leader Mitch McConnell declined, Flake announced he wouldn’t vote to advance any judicial nominees.